This past weekend we visited our son and his family. They had adopted a German shepherd puppy a few months back and it was time for us to visit Axl. His mother is a white shepherd and his father most likely a black and tan. White shepherds have especially large ears as you can see with Axl. If he were running into a headwind, it would be a good idea to trim his sails; he’d probably pick up three or four miles an hour. Axl was one of nine puppies that Echo Dogs White Shepherd Rescue had taken in. Well that’s not quite accurate; they took in his mom who was pregnant. Axl and his brothers and sisters came along shortly after that. We had lost our dog in the mid ’90’s and were dogless for a long time. But then our friend Joyce, president of Echo Dogs, visited us with Powder, a white GS who had been rescued from a puppy mill and who was down to 43 pounds before she was saved. Powder made quite an impression on that and many later visits, some at our house and some at Joyce’s in Downers Grove, IL. At Joyce’s, Joyce would sleep in her bedroom with Powder and another dog, Jazz; my wife Ellie slept in the guest bedroom and I slept on the couch in the living room (it is rumored that I snore). All these rooms are close together. When Joyce would get up in the middle of the night, Powder would visit her good friend Barry on the couch. This would be around 3:00 AM. I would wake up with a very earnest nose about two inches from mine and Powder would be telling me that we needed a dog too, preferably a white shepherd, and more preferably, one that was up for adoption. For one reason or another, we ended up getting Prince from a breeder but he was bored after a year or so and we got him a brother who was a white GS rescue. This is Prince (on the ground) meeting Tuck for the first time. So we have followed Powder’s recommendations in two generations of our family. Ellie and I have Prince and Tuck while our son and his family have Axl. And we still have our friend Powder. If you are looking for a dog, please consider your local rescue organizations. They have some great companions for you. God is the original creator and continues to create. Everything is part of God, God is in everything, everything in the Universe is therefore connected. We humans, as part of God, participate in creating. The consequences of our actions are far broader than we can see. I’ll develop these ideas over future posts and today I will start with the last, concerning consequences of our actions. It begins with this: we were on our way to Maine for the wedding of the daughter of friends of over 40 years. These friends were originally from Tennessee but have lived in Maine ever since we have known them. Tennessee is still in their voices. We stopped for dinner on the way up and my wife Ellie wanted to get a small gift for Mary Lee. She saw a t-shirt with the inscription ‘GRITS Girls Raised In The South’ and bought it. Mary Lee liked the shirt but with all the activity around the wedding, it was quickly forgotten. Our friends go back to Tennessee every year and we make it a point to get together for a couple of days. Some years after the wedding we were together and Mary Lee asked if we had any favorite Southern women writers. We mentioned Bailey White but didn’t come up with others. Then Mary Lee said ‘Oh, let me tell you what this is about.’ She had been walking down the street in Brunswick ME wearing the GRITS t-shirt. A woman came up to her and said that she was raised in the South too. Well, one thing led to another, and out of this came a kind of support group of several women raised in the South. They have lunches, a book group, etc. All of this out of the choice of a simple gift. Who would have known? On another occasion, Ellie, our friend Joyce and I were coming back from a trip and stopped in Berea, KY, a community strong in arts and crafts. We were wandering around a gift shop and since we were the only customers in the store, the clerk wasn’t busy and there was an appealing dog there, I asked the clerk if she minded if I photographed the dog. She said sure, go ahead. I offered to send her pictures via email but she said while her husband did email, she didn’t. The way she said that suggested that she didn’t want to ask her husband to bring the pictures up for her. I asked if I could send her prints and she gave me her address. I sent off a couple of 5 X 7s and forgot about it. Several weeks later I got a thank you note in which she said that she and her husband were now divorced and that Aris, the dog, was one of her few friends. Who would have known? I’ve mentioned our dogs on a couple of occasions and I thought it would be good to introduce them. That’s Prince in the foreground. Tuck is in back. I know, everybody names their dog Prince, but he comes by it honestly. Growing up, we had a white collie/border collie mix by the name of Prince who got his name from the white collie my great grandfather had on his farm. My great grandfather’s name was George King and he had a pair of draft horses he named King and Queen so when a dog came along what choice was there but to name him Prince? 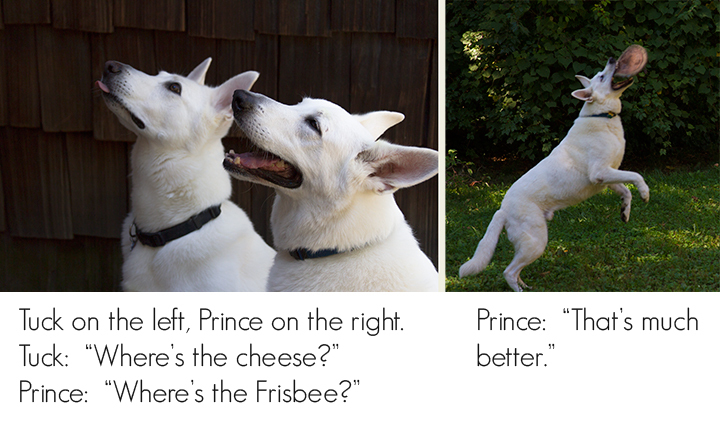 The current Prince, Prince III I guess, is a White German Shepherd. He is rather large and rangy and his favorite past time is chasing tennis balls and Frisbees. A trip to the bark park for him is a trip to Heaven. We had never heard of the White German Shepherd breed until a friend of ours introduced us to Powder, a magnificent member of that breed. Powder spent her first three years in a puppy mill giving birth to at least one litter of puppies and probably more. The puppy mill was closed down and Powder was rescued by Echo Dogs White Shepherd Rescue. She weighed about 45 pounds and it wasn’t even clear that she would live to make it to the vet. She did and now she is a poster child for dog rescue work. She lives with our friend Joyce. When we visited Joyce, Powder would sleep in the same room as Joyce, my wife Ellie would be in the guest bedroom and I would be on the couch in the living room. Joyce would get up in the middle of the night and Powder would go in search of her great good friend Barry. I would wake up at 3:00 AM with a very earnest nose in my face. Powder was there to tell me how important it was for us to adopt a White Shepherd. Tuck has been with us two years now and neither he nor Prince are bored. Tuck also likes to go to the bark park. Thanks, Powder, you have good ideas. Some days are a gift. It was nicely cloudy this morning when I had the dogs at the bark park. In between throwing tennis balls for Prince and Tuck I was able to get in a few shots. The clouds largely disappeared and later in the morning I was on the Fall Creek Trail at Fort Harrison State Park. It’s hard to beat an autumn day, a good day for smelling the leaves and kicking through them. Inside every six year old boy there is a six year old boy. Inside every 70 year old man, there is a six year old boy. We were having a warm spell and a lot of people were enjoying it. This is very nice too but the brightness on the right side of the tree to the right of the path suggests why it isn’t a good idea to shoot at this time of day if it can be avoided. All in all, a good result with new technology and better yet, a good day to be outside.